Okay, so I am a big Nobu fan. I have been to a couple of different locations and oyyy, I fall in love every time. Not just with the superb, delicate, mouthwatering food, but with the interiors! 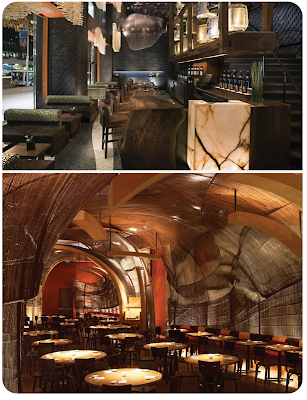 David Rockwell is a design maven and each restaurant showcases his striking conceptual abilities. Nobu restaurants are currently in 15 locations around the world and are now expanding into hosplitality. There are two Nobu Hotel and Residences being built. The first in North America will be located at 45 Broad Street, in New York. The second location is on Israel's Mediterranean coastline and is just minutes from Tel Aviv. Both are being designed by The Rockwell Group which will create both hotel interiors and their respected restaurants. Thus, I will be anxiously awaiting the arrival where I can be in 'eat/sleep' heaven. Rendering of New York location.